The World’s Most Famous Arena’s current building is Madison Square Garden’s 4th location in New York City. Did you know that in 2023 it will most likely have to move again? Opening on February 11, 1968, the MSG IV is now considered to be the oldest, and most active major sporting facility in the New York metropolitan area. MSG wasn’t directly named after the 4th President, James Madison. It adopted the name of the Madison Square, a park located between 5th Avenue and Madison Avenue at 23rd Street – the location of MSG’s first structure. 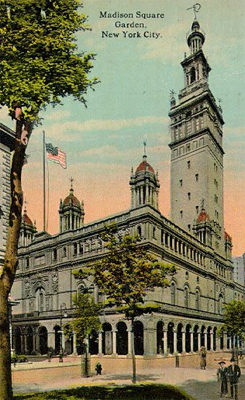 MSG IV was built after the Pennsylvania Railroad tore down the above-ground portions of Pennsylvania Station. The new structure was one of the first of its kind to be built above the platforms of an active railroad station. 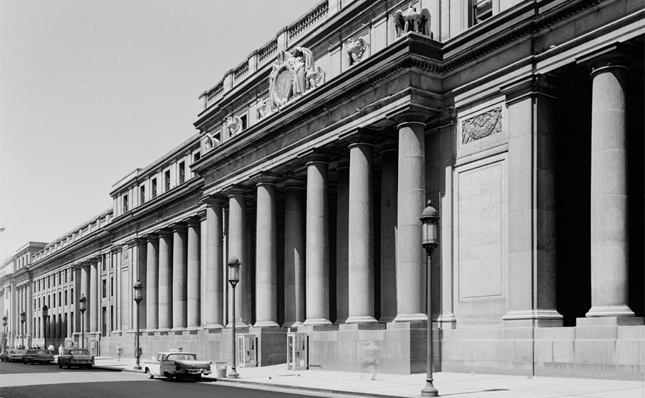 The New York City Landmarks Preservation Commission was created in 1965, following the public outcry after the destruction of Pennsylvania Station, an outstanding example of Beaux-Arts architecture [photo below], to make way for the construction of the current Madison Square Garden. Currently, Madison Square Garden is seen by some as an obstacle in the renovation and possible future expansion of Penn Station. In June 2013, the New York City Council Committee on Land Use voted unanimously to give the Garden a ten year permit, at the end of which period the owners will either have to relocate, or go back through the permission process. The first Madison Square Garden was built before James Naismith invented the game of basketball. 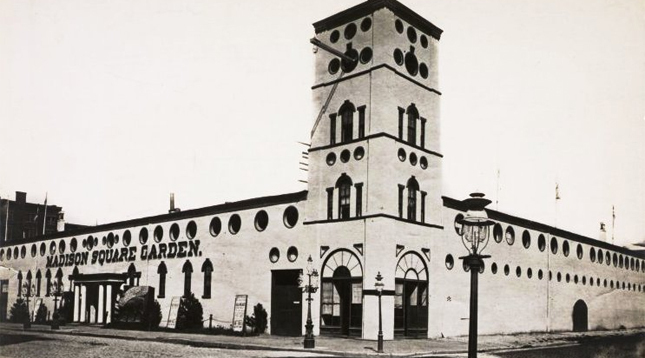 In 1879, the first artificial ice rink in North America was opened at the Garden (MSG I). Elvis Presley made entertainment history in 1972 by becoming the first entertainer to sell out four consecutive shows at Madison Square Garden. During Judas Priest’s 1984 tour performance, the audience ripped apart the foam seats and threw them onstage, causing over a quarter of a million dollars in damage to the venue. The group were banned from performing there again. In 1988, Madison Square Garden chose the March 3 concert by Michael Jackson as the greatest concert ever held at the venue. The Garden is the only venue at which each of the four former members of The Beatles played solo concerts after the breakup of the band – although not at the same time. From 1979 to 1994, The Grateful Dead played the Garden 52 times, including two nine-night runs in 1988 and 1991. Phish has played the Garden 31 times including 8 times on New Year’s Eve. Sir Elton John has played 62 concerts at the MSG, more than any other artist. Michael Jordan had his first game in the professional field there against the Knicks. He was given a standing ovation for his thirty-three point win. MSG is known for its place in the history of boxing. Many of boxing’s biggest fights were held at Madison Square Garden, including the first Muhammad Ali – Joe Frazier bout. Before promoters such as Don King and Bob Arum moved boxing to Las Vegas, Madison Square Garden was considered the mecca of boxing. In 1990, Andrew Dice Clay became the only comedian in history to sell out Madison Square Garden two nights in a row. On December 12, 2012, Madison Square Garden hosted a concert to benefit the victims of Hurricane Sandy that devastated many parts of the New York metropolitan area. Notable performers were Eric Clapton, Bruce Springsteen, Bon Jovi, Roger Waters, Eddie Vedder, The Who, The Rolling Stones, Billy Joel, Dave Grohl and Paul McCartney. The concert lasted over 5 1/2 hours and was broadcast live on many cable stations. The event was a great success and raised over $50 million to help hurricane Sandy victims. The torch from the Statue of Liberty was kept on display at Madison Square Park from 1876 to 1882.